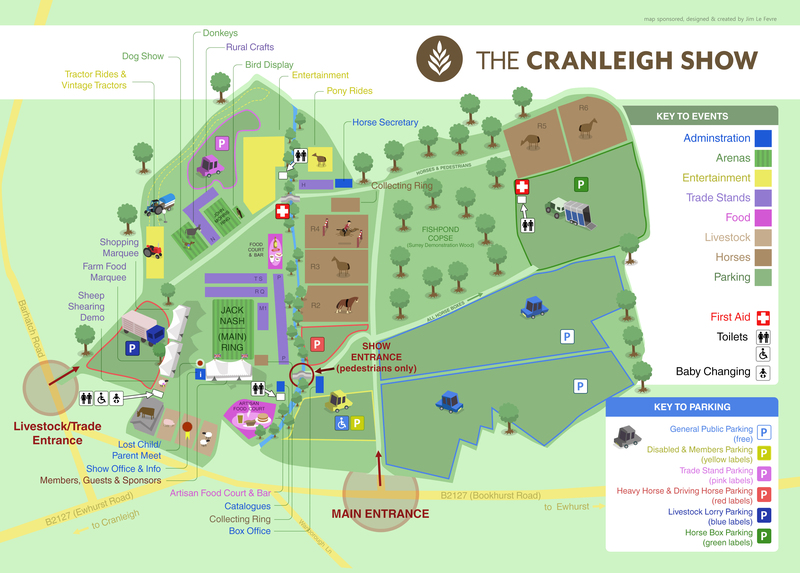 The Cranleigh Show offers exhibitors a unique trading opportunity in the heart of the Surrey countryside. Our 10,000 or so visitors come from a wide area around the South East of England; they are discerning and quality driven and are interested in an extensive range of optimal goods and services. The celebration of the countryside is the essence of our show, so we particularly welcome applications from sole traders and small businesses with a rural emphasis. We are however keen to attract businesses of all types. The Show is a great place for go-ahead businesses to exhibit and our trader profile covers everything from hand crafted items and delicious food to garden furniture and electric cars. The Show venue is central and easy to travel to, and there is plenty of parking. The ambience is unhurried and relaxed, perfect for browsing and buying by eager customers. Our friendly team will make it a memorable experience, whether it's your first stand or your fiftieth, so contact us for details and put the date in your diary. For full details on what we offer, including pitch sizes and prices, please download the Trade Stand Information below. Applications can be made online by following the links below. Applications must be supported by a Risk Assessment and valid Public Liability Insurance (for details please see the Trade Stand Information). Artisan Food pitch applications are offered on a 'by invitation only' basis. If you would like to be considered for the 2019 Cranleigh Show, please contact the Secretary. Trade stands are an integral part of the Cranleigh Show and browsing along our trade stand avenues provides a unique shopping experience for our visitors. Our outside trade pitches are for those who have their own marquee/gazebo/trailer and just require an open space to erect it in. The spaces come in 6 metre or 12 metre depths and start with 3 metres frontage going up in 1 metre sections. Prices start from £78 + VAT. If you would like to be part of our 2019 Show, please download and read a copy of the Trade Stand Booking Information 2019. Follow the link below to submit your application online. Alternatively you can complete the Application Form contained within the Trade Stand Information 2019 and send it by post. A 20% discount is offered to all applications received before 31st January 2019. Our busy, vibrant Farm Food marquee and Shopping marquee house around 65 stands in large, bright separate marquees located opposite the Main Ring. The Farm Food marquee is for food businesses selling products for consumption off-site and the Shopping Marquee is ideal for those selling handmade or craft goods. The stands in both marquees are 3 metres deep with a frontage of 3 metres, but additional frontage may be purchased at the time of booking. Electricity points and table hire are available at an extra charge. These stands start at £120 + VAT for a 3 metre x 3 metre pitch. If you would like to be part of our 2019 Show, please download and read a copy of the Trade Stand Information 2019 and follow the link below to submit your application online. Alternatively you can complete the Application Form contained within the Trade Stand Information 2019 and send it by post. These pitches are offered free of charge to exhibitors who make all, or the majority of, their own merchandise and who are willing to add interest with demonstrations to or ‘hands on’ involvement from our visitors, wherever possible. 'Rural trade or traditional craft’ includes activities such as basketry, bee keeping, blacksmithing, broom making, chair caning, hedge laying, print making, spinning, stone masonry, thatching, weaving, wood working, etc. If you are unsure if your trade qualifies, please contact the Secretary prior to booking. If you would like to be part of our 2019 Show please download and read a copy of the Rural Trades & Traditional Crafts Pitch Booking Information, complete the Application Form contained within and return by post.